How to Transfer Music from One iPod to Another? Three Solution! How to Transfer Music from One iPod to Another? Three Solutions! The iMyFone iPhone Transfer is an exclusive one-stop solution that enables you to freely control and manage your iPhone/iPad/iPod data easily and conveniently. Therefore you don’t have to get frustrated over muddled up files. It serves as a bridge between your iPhone iPhone/iPad/iPod and iTunes/PC without any sync-block. It also enables you to enjoy your favorite songs and movies anytime. Two-way transfer: You can send songs from your PC or iTunes to iPod and from iPod to iTunes/computer. Transfer non-purchased music: It enables you to transfer both non-purchased songs and purchased music. All media files supported: Files such podcasts, home video, music video and iTunes U which cannot be transferred via iTunes can be transferred. Support all formats: It supports nearly all music and video formats and offers conversion as well. Rebuild iTunes library: When iTunes get damaged/corrupted, it can recover songs without have to access iTunes. If you want to transfer music from one iPod to another, you need to transfer the music first to your computer then export them to the desired iPod. Step 1: Using the Apple USB cable, open iMyFone TunesMate, and plug your iPod into your computer. Step 2: Click “Music” tab on the top bar and you will be in the “Music” window. Or you can also go to “iTunes U/Audiobooks/Podcasts” from the left sidebar. Select the songs you want to export and click “Export > Export to PC”. Step 1: On your computer, open iMyFone Tunesmate and use a cable to connect your iPhone/iPad/iPod. Step 2: Tap on the “Music” tab located on the top bar, then by default, you will be in the “Music” windows. Or you can choose “iTunes U/Audiobooks/Podcasts” which is found in the left sidebar. 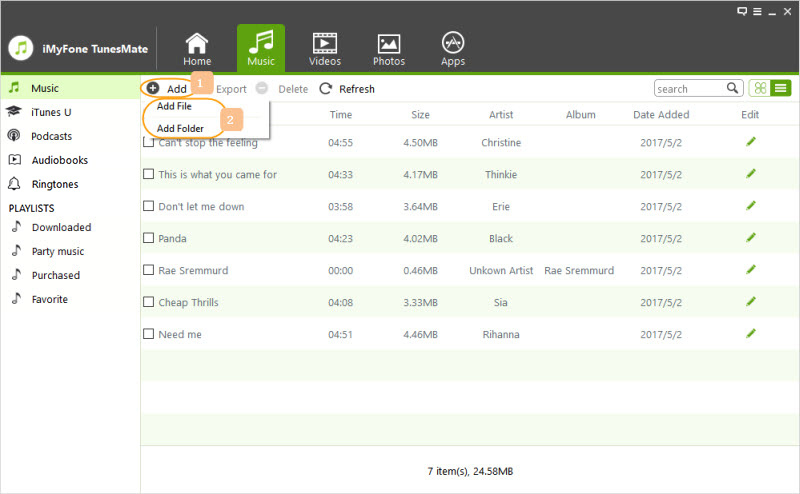 Step 3: Click on “Add File/Folder” to send songs to your PC. If you like to export some special songs, then select “Add File.” After that, find your computer music and click on the “Shift” or “Ctrl” key while choosing music files to select many songs. 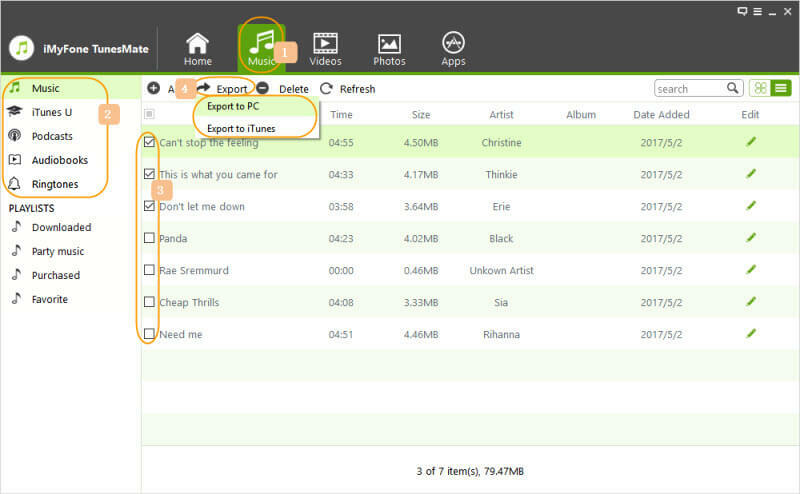 In case you wish to export all the music in on folder, select “Add Folder” and find the songs on your PC. After that, tap “Open” to send the all chosen songs from PC to iPhone/iPad/iPod. Step 1: Connect your iPod to your PC using a USB cable and wait for the device to be recognized by iTunes. Step 2: On the left column of iTunes, click on the iPod icon. Choose the “Music” tab and select “Sync Entire Music Library.” After that, tap the “Appy” button and wait for the iPod to complete its synchronization before you disconnect the device. Step 3: To create a playlist, tap on the plus sign located at the lower-left corner. Type a name for your new playlist then tap and drag each desired song over the playlist’s icon. Step 4: Use a USB cable to connect the second iPod to your PC, and then select the “Cancel” button when iTunes automatically ask if you would like to sync the iPod to the music library. Step 5: Tap the iPod icon located in the left column and select the “Music” tab. After that, select the “Sync Music” option and tap the circle adjacent to "Selected playlists, artists, and albums." Step 5: When prompted, select the playlist you created and tap the “Apply” button, then iTunes will begin to copy the music files to the device. Some songs may not be seen by iTunes. Transferring lots of music files may take time. If you want to transfer music from one iPod to another without using computer, you need to use the same Apple ID on both device. Login both your iPod with the same Apple ID. Go to iTunes on the iPod and tap on the purchased tab. Then you can download the purchased music to the other iPod. 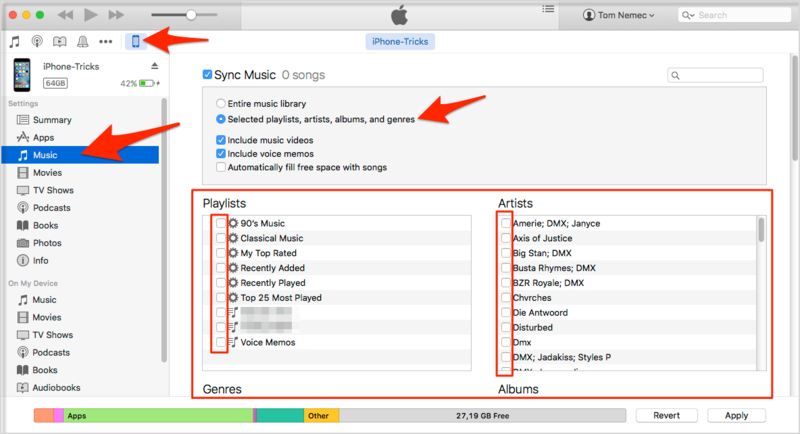 Note: Only the purchased music can be sync by this way.